I’ve wanted a dashcam ever since I learned that they were a thing. The idea of being able to show video footage of that lunatic who pulled out in front of me rather than just ranting about it is a somewhat attractive proposition. Russian footage of a meteor coming down overhead, or other unexpected & spectacular events have also made me want to have some way of recording my car journeys. I’ve tried solutions in the past, including making a stand for my phone to use as a video camera. I made it out of fimo and the results were abysmal. I also tried it with an action camera that I got for Christmas. The results were better than my awful phone camera stand but still shaky and not what I had hoped for. Halfords got in touch to ask if I’d be interested in checking out a new dashcam – the Next Base Dashcam 412GW. You’ll not be surprised to hear that I said yes, please. The Next Base Dashcam 412GW comes with an attachment which sticks the camera to the screen and the appropriate power leads. It’s a study looking thing with a slight fish-eye camera lens to enable a wide capture area. 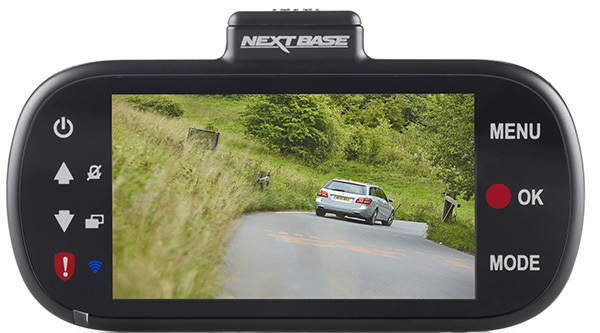 It also has the nifty option of connecting to a wi-fi connection to download and share footage instantly onto your mobile or tablet using the Nextbase Cam Viewer app (Available on IOS or Android). Nice! Initially, I had a problem getting the camera to stick to my car window. It kept falling off, but a little googling, elbow grease and some long needed window cleaning sorted that issue out. So, what does the actual footage look like? Well, here’s a video I uploaded of footage under different conditions. As you see from the footage, it’s great HD quality. There’s also the option to record loads of info onto the video file. You have the GPS location (longtitude / latitude), the speed you’re travelling, and the date / time. From an insurance point of view, this is perfect if you’re in an accident. It gives you an accurate witness, proving (hopefully) that you weren’t speeding and that you weren’t to blame! There are a wealth of options within the menu. You can change the resolution of the camera, change display options, and pick whether the recordings are stored in chunks of 2, 3 or 5 minutes. Storage is on a micro sd card (not supplied). There are two leads supplied for charging the unit – one that plugs into usb, and a heck of a long one that plugs into the car’s cigarette lighter. It’s a brilliant dash cam. The quality is outstanding and it’s fantastically easy to use. You would be very pleased if you were to get your hands on one of these. 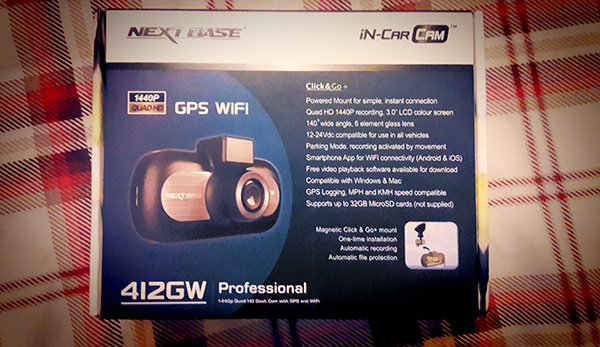 The Next Base Dashcam 412GW is available from Halfords for £129. Previous Article Blogging sick leave.... over! Thank you for a nicely written detailed explanation. It impressed to me. I was looking for the detailed review.